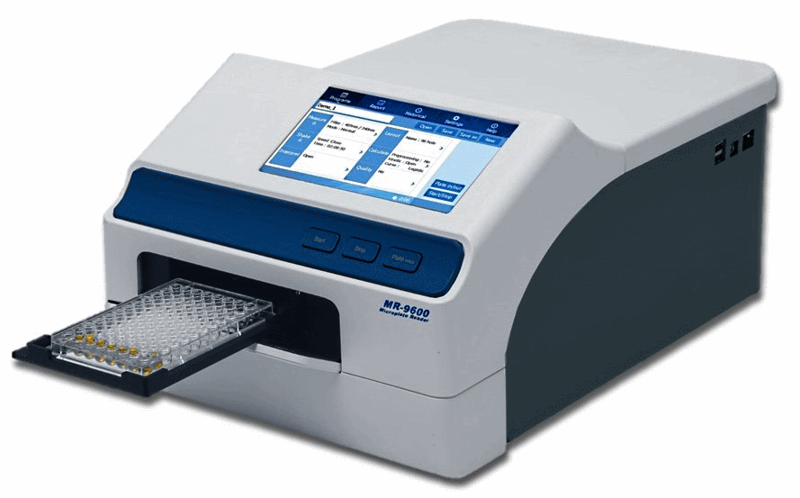 The Accuris SmartReader 96 is a welcome addition to any lab that is routinely measuring concentration or absorbance in 96 well plates. The instrument’s 7 inch touch screen, intuitive software and graphical interface makes it easy to use as a standalone instrument (a separate computer and additional software is not required). This is a cost effective method of measuring ELISA, Protein Assays and other micro-titer based tests. The touch screen or a connected mouse is used for programming and operation. The menu interface allows the user to choose the wavelength filter, set shaking parameters, enter details of the plate layout, and also choose the details for the reading protocol and data calculations. Up to two filters can be used for 2 measurements of the sample plate, for calculated comparisons. Kinetic calculations can be performed by setting multiple readings. The SmartReader 96 is a convenient stand alone reader, all software and the programming system is incorporated into the electronics. However, a convenient USB port on the side allows quick and easy saving of data files to a USB drive, and the universal .csv files can then be shared or transferred to a computer for storage or further processing. A data port can be used for connecting a computer or basic printer. The plate layout interface allows for quick and intuitive set up of a plate’s well contents. The display shows a graphical representation of the 96-well plate, and the user can label each well as required for: “known standard”, “unknown sample”, “blank well”, “QC control well”, “negative control”, “positive control”, or “empty”. The interface allows highlighting and labeling multiple wells to save time. Measurement data is available immediately on the screen after a reading, as well as interpretations, calculated analysis and curve fittings.